SU Camp took place from 27th till 29th March 2015. The theme for this year was “Amazing Grace” where the idea of the Grace of God and the Amazing Race were combined. As we got to camp, excitement and happiness filled the air despite the weather looking gloomy. As the weather started to clear up some more, the excitement increased even further. During the weekend we noticed that the atmosphere was relaxed and there were a greater bond between leaders and children. The theme was well incorporated where teamwork was shown even during roadblocks and detours. Thank you to all the children that came, the leaders for the willing hearts and to Mrs Elie and all the staff for making sure that everything was kept in control. Wow!! What an awesome weekend it has been! The annual Choir Camp was held at Sumcay Camping Grounds this year and to say that we had fun, would be a huge understatement. Our weekend started off with a long practise session in the school hall on Friday and although the hot weather made it difficult to get anything done, we pushed forward and like true Riebeek ladies, got through the practise sucessfully. The first event we held at Sumcay was the Talent Show. Everyone participated in groups and showed off a variety of talents like acting and singing. All the acts were so entertaining that we ended up having TWO overall winning groups. We ended the night by watching a heartwarming video put together by the Matrics in honour of their senior choir career. Our next practise started early on Saturday morning. We got off to a rocky start but thanks to Mrs Zietsmann, Miss Van de Westhuizen and Timothy, by the second hour, we were doing well. The session ended just in time for lunch and during that break, we were given time to take a dip in the pool and relax. Meanwhile, Mr Jonas drove a small group of girls to Mr Nzo's house and on the way back to camp, they got a chance to work together on improving the Xhosa song. Mr Nzo was very impressed that we composed our own Xhosa Song and kept complimenting us on it, which was very humbling and encouraging. We spent the next fews hours perfecting the Xhosa song with the entire choir. We tapped into our creative sides as we came up with fantastic moves that are guaranteed to wow any and all crowds. Mr Nzo's advice and suggestions really helped tremendously, and for that we are unbelievably greatful. After that session, we called it a day for serious choir work and instead got together in our voice groups and participated in Mrs Zietsmann's Sing Off competition. Each voice group performed an acapella song of their choice and wowed our judge, Mrs Woods. Competition was tough, but in the end, the first runner up was the First Soprano group and the winner was the First Alto group. Sunday was filled with mixed feelings. On one hand we all looked forward to going home, but on the other we didn't want to leave. Mrs Mapoma started off the day by giving us an inspiring talk about walking in the light of God and as a choir, and as individuals, putting our faith in Him. After that we had a very productive yet short practise before heading home at 10h00. Mrs Zietsmann closed off the day by reading us this quote, "A funny thing about life, when you accept nothing but the best, you often get it." Naqeehsa Koester said, "Thank goodness for camp! I feel so much more confident about the music. I'm ready to tackle any competition!". Ambesa Daniels enjoyed bonding with her roommates and with her voice group, the second Altos. Chulumanco Mayi's favourite moment was when her voice group won the Sing Off competition. Pumela Kondile and Lisa Duruwe enjoyed working on the Xhosa Song moves. Firstly, we would like to thank Miss Van de Westhuizen, Timothy, Mrs Mapoma, Mr Jonas and especially, Mrs Zietsmann for taking time out of their lives to spend a whole weekend with us. Thank you to Mrs Zietsmann's colleagues for keeping our tummies filled with delicious food throughout the weekend. Finally, we'd like to thank Mrs Woods for her everlasting support and love. Kim Stevens Randell (Class of 1994) studied Public Relations Management at PE Technikon before obtaining her Bachelor of Arts, Honours in Psychology and Postgraduate Certificate in Education (Foundation Phase) from UNISA. She worked at the University of Witwatersrand for 11 years, and headed up postgraduate admissions until September 2013, when she resigned to follow a career in teaching. Kim married Dr Bruce Randell, a consulting civil engineer who owns his own business, in 2002. She combines her passion for children and ballroom dancing by teaching a weekly dance class at a children’s home outside Johannesburg. Kim’s most beautiful childhood memories of her time at Riebeek include creating ‘magic medicine’ with Brigit in Mrs Sellick’s Standard Two class, sharing the excitement of being elected Senior Head and Deputy of the Library with Chantelle, and all the annual Carol Services. Never losing her childhood competitive streak, Kim misses being involved in the cultural and sporting activities of Riebeek. Mrs Sellick, Mrs Stark and Mrs Young had the greatest impact on her childhood. Anthea Du Preez Wepener (Class of 2004) studied Hotel Management at Varsity College in Port Elizabeth but later left the hospitality business to follow her real passion and became a dog groomer. She married Dup Wepener, an air-con technician, in 2009. Anthea is blessed with two gorgeous children, Daniel Andrew, 11, and Zoe Jessica, 4. In her free time she enjoys spending time with her children, playing sports and coaching hockey. Anthea, who has kept her childhood bushy hair and Colgate smile, feels the worst part of being an adult is having to worry about money. At Riebeek, Anthea learnt to let go and express herself, which is a lesson she hopes her own children will learn. 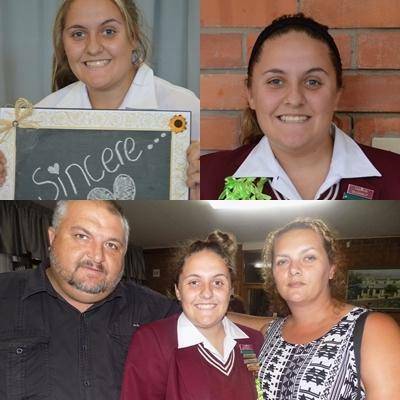 Miss Cooper, Amy Daniels and Jessica Bubb had the greatest effect on her childhood, and her favourite memories of her time at Riebeek are of everyone sitting in the corridor when it rained. Zimasa Kala (Class of 1994) obtained a National Diploma in Internal Auditing from PE Technikon, as well as a Post Graduate Diploma in Systems Management and a Masters Degree in Development Finance from UCT.She currently holds the position of Loan Monitoring Manager at the Eastern Cape Development Corporation in East London. Zimasa has two daughters, Butshabethu, 11, and Khwezi, 6, both attend Hudson Park Primary. In her spare time, Zimasa enjoys reading, contributing to Drum Magazine, going away on holiday and celebrating each day. She hopes today’s children learn that being different gives you a competitive edge, and that they enjoy discovering different aspects of themselves and their environment in their own good time. The teacher who had the greatest effect on her childhood was Mrs Natalie Stear. Birgit Jeske Puttergill (Class of 1994) obtained her BCom from UPE and, after working in Purchasing at VW for 10 years, now acts as bookkeeper and chief administrator of the family farm. Birgit married Grant, a dairy farmer, in 2005 and the couple have 2 children, Oliver, 7, and Gabriella, 5. Her most beautiful childhood memories of Riebeek include cycling to school and back every day, playing 4-square, science experiments, and Inter-house Plays. To Birgit, a beautiful childhood is carefree and full of love, a place where the burden of time is not felt, and creativity and imagination have no limits. Beverley Serfontein Fourie (Class of 1969) studied Medical Technology at both the PE and Johannesburg Technical Colleges. She married Stephen Fourie, a Registrar at Rhodes University, in 1974, and the couple have two children, Ian, 36, and Nicola, 34. In her spare time, Bev enjoys reading, taking photos, sewing, gardening, travelling and game viewing. Her most beautiful memories of her time at Riebeek include abducting a boarder from the hostel and arriving at final assembly in a pre-arranged police van. She will never forget Miss Bartlett’s “Moderation in all things, girls’’ during assembly, and Mrs Chaplin encouraging neatness and clear mindedness when tackling tasks such as Maths. Carine Baard Parks (Class of 1994) obtained a Higher Diploma in Education from UCT and has been working in the United Kingdom since 1999. She is currently in Senior Management in Education, with experience in Special Educational Needs. Carine married David Parks, a senior IT programmer, in 2006. They met at UCT in 1995. The couple have two children, Fletcher, 8, and Mackenzie, 6. Carine lives a busy life, but when she gets the chance she enjoys cooking, entertaining, travelling and enjoying time with friends and family. Michela Civico (Class of 2004) studied Hotel Management at Varsity College, and then studied Bookkeeping. She is working at Fiume Engineering. Michela is a family orientated person, who has a great love for Ferraris, so much so that she named her dog Enzo Ferrari. Her most beautiful memory of Riebeek is of her time spent running up and down hills, and she would like today’s children to learn that they should go outside and have fun, as technology is not everything. The teacher who had the greatest impact on her childhood was Mrs Gerber. Elaine Parfitt Hornby (Class of 1989) currently works as a SAP Applications Consultant. She considers her job a blessing as she is able to meet many interesting people and learn something new every day. She has three children, Candice, 25, Josh, 17 and Bryce, 11, who are her life. She enjoys relaxing with friends and family in her free time. Elaine’s most beautiful memory of her time at Riebeek is of everyone tanning their legs in the quad at break. She believes a beautiful childhood is one in which you know you are loved but where you realize that life has consequences. Elaine misses all the holidays she had whilst at Riebeek and feels ex-principal Mrs Stear had the greatest influence on her childhood. She thinks responsibility is the worst part of being an adult, and would like the children of today to learn patience and compassion. Justine Krisman Dreyer (Class of 2004) studied Medicine at the University of Pretoria. She married Rudie Dreyer, an entrepreneur, in 2007, and together they have a one year old baby girl, Zoe. Although Justine finds being a doctor a huge blessing and very rewarding, she is currently looking after her baby full time. She hopes to specialise in psychiatry, and enjoys reading, playing piano, gardening, scrapbooking and blogging. Justine’s most beautiful childhood memories of her time at Riebeek include playing hand tennis in Grade 5, pretending to be the Spice Girls in Grade 6, and last minute study sessions with friends before school. She thinks that a beautiful childhood is one where safety and love abound, potential is nurtured, friendships are built, talents are discovered, confidence is gained, the self is explored and the future appears as a road of promise leading off into the horizon. Urslynn Machiu (Class of 2013) is studying BCom Mathematical Science at the University of Stellenbosch. Urslynn is a positive and upbeat person who enjoys travelling, meeting new people and discovering new things. Urslynn remembers her days at school as beautiful ones full of laughter and friends that always stuck together. Urslynn also remembers making up the most ridiculous songs with her classmates and Mrs Stevens comments in Maths class. Urslynn’s fondest memory is of the choir. Jocelyn Carey Purcocks (Class of 2010) is in her final year of studying Occupational Therapy at the University of Stellenbosch. Jocelyn enjoys hiking, camping and sight-seeing. She also enjoys socialising with her friends when she gets a break from work. When Jocelyn thinks of her school days she remembers those early mornings, waking up excited for a hockey match, strenuous but fun drama rehearsals and enjoying errands for Mrs Gerber. Jaydee Macdonald (Class of 2011) is currently in her final year of her BA Degree with majors in English Literature and Psychology. Jaydee enjoys spending time with her friends and family when she's not reading or working out at the gym. Most of Jaydee's memories of school are related to depending on the Holy Spirit to get her through Physical Science, the intense rise in blood pressure when Mrs Stevens handed out Maths papers from the highest mark downwards. Jaydee remembers her pet 'snake' named Luzuko that made her last cultural induction dinner really emotional. Jaydee said that she will always remember Riebeek as the biggest, most beautiful schooling gift her mother could have given her. Lache Windvogel (Class of 2012) is studying towards her BCom degree in Chartered Accounting. Lache's fondest memories of school were Founder’s Day and singing "Let us now praise famous men", the cultural events that made school worth it and English classes with Mrs Swanepoel. Lache is passionate about working in her community and helping others. She's learnt that as someone who was blessed with such amazing opportunities has to give back to their community to try and uplift the youth so that they can also be afforded opportunities and not be afraid to try new things. Kim Bermosky (Class of 2002) studied at the University of Stellenbosch and earned her Bachelor of Science degree and she later got her Bachelor of Surgery and Medicine at Walter Sisulu University in Mthata and is doing her community service at Settlers Hospital, Grahamstown. 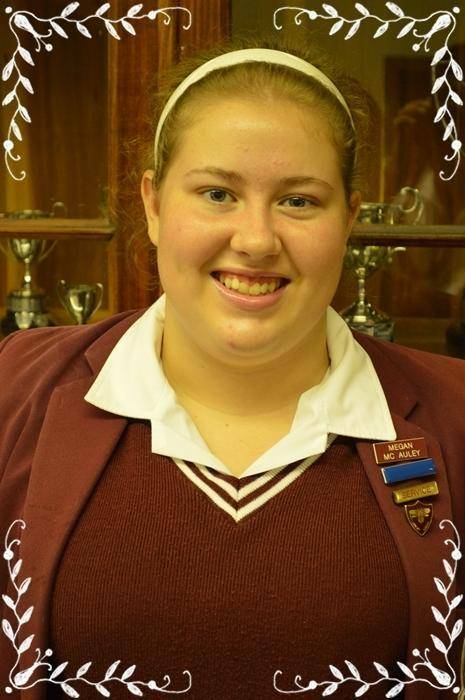 Kim’s most beautiful memories of Riebeek are serving on the Cultural Board, being head of Drama and being a prefect. 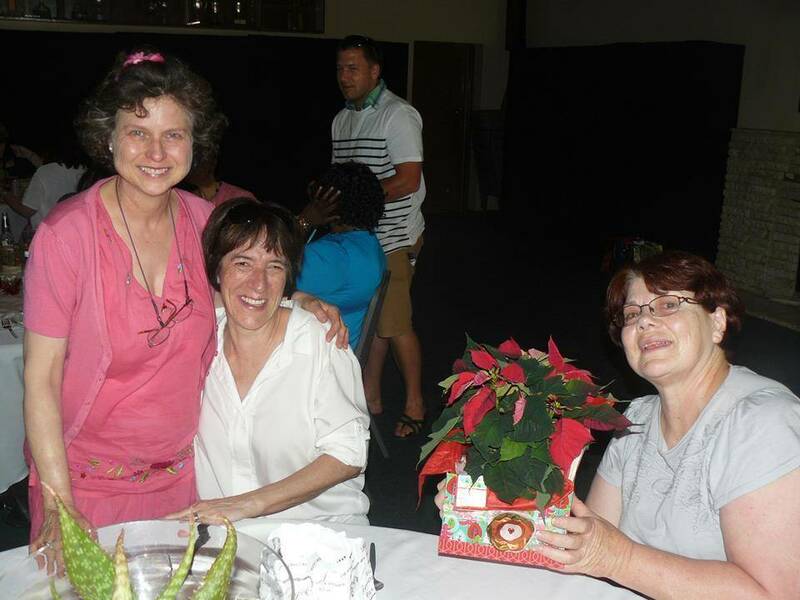 Kim is truly grateful for the staff of the school for moulding her into the person she is today. Stacey Simons-Welcome (Class of 2005) studied Financial Accounting at Damelin and works for Santa Lucia Trust. She married Evan and they have 2 beautiful children: Leah, 3, and Zachary, 8 months. Stacey enjoys days out with her husband and children. Some of her most beautiful memories of Riebeek are of Mr Hoare and his ‘mossies' and of fellow classmate, Yolande Mbane, always falling asleep in History class. Nazma Smith (Class of 2007) has a BA in Communication and works at Audi Centre Port Elizabeth as a Web Administrator. Nazma is currently engaged and enjoys doing yoga and anything creative. Some of her beautiful memories of Riebeek are of break times with her friends in the quad and of Mrs Immelman’s English classes. Nicola Ngqeza (Class of 2011) studied Business/Marketing Management at EMC and is an intern at the municipality. Nicola enjoys spending memorable moments with friends and family since they matter the most to her. Nicola mostly remembers her school days as those full of laughter and classroom banter but one of her fondest memories is that of a teacher chasing a girl around the classroom for her cell phone. Zanele Titi (Class of 2012) is studying towards a BSc in Construction Economics. Zanele is part of the recently launched NMMU radio station. Zanele is a frank and open person who has a solution for problems that come her way. Zanele remembers her school days as being actively involved in extra murals, such as drama, choir and debating. Zanele feels that her extra murals equipped her with the vital skills that are needed at university level. She enjoys what she is studying now and the many challenges it brings. Mandy-Lee Dawson Brophy (Class of 1989) is a qualified Social Worker, and is lecturing at NMMU. She married Louis Brophy, a Health, Safety and Environmental Coordinator, in 1998 and they have a daughter, Hannah-Kate, 5. At Riebeek, Mandy-Lee learnt that you can achieve any dream if you put your mind to it. She believes that a beautiful childhood is one where you are able to discover the real you, and experience unconditional love. Angela Cox Nash (Class of 1989) did a secretarial course at Russel Road College. In 2002 she married Tim Nash, a businessman, and they have 2 children, Emma, 8, and Riley, 6. Riebeek taught Angela to work hard and respect others. She misses the midnight feasts and strawberry pavlova enjoyed by all the hostel girls. She believes that a beautiful childhood is one filled with lots of love, happy memories, traditions and laughter. Lauren Gouws Frueholz (Class of 1989) obtained a National Diploma in Tourism from the PE Technikon and works at Rennies Travel in East London. She married Peter Frueholz, a Mechanical Engineer, in 2011 and the couple has a daughter, Abbey, 2. Lauren’s most beautiful memories of her time at Riebeek include break times spent tanning her legs with friends. She believes a beautiful childhood is the grounding for a brilliant adulthood. Loren Botten Nel (Class of 1989) obtained a BA Ed in Human Movement Science from UPE and runs her own business called Active Eyes. She married Deon Nel in 1997, and the couple have 2 children: Byron, 11, and Kate, 8. 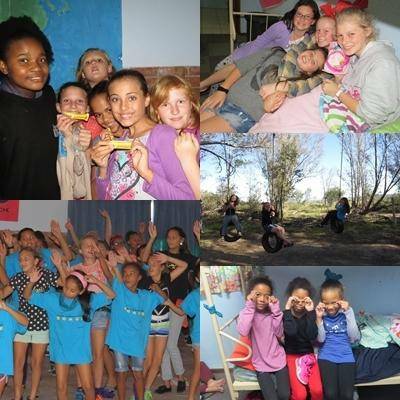 At Riebeek, Loren learnt about commitment, determination and perseverance. She remembers fun times on numerous hockey tours, and at discos and dances. Loren believes that a beautiful childhood is one where children can play until dark. Amy Relling (Class of 2009) studied health and skincare at Total Concept Academy in Port Elizabeth. She received her international diplomas and decided to explore the world by working on cruise ships. She worked abroad for 2 contracts, each 9 months at a time, and has been fortunate enough to visit many different exciting places including Alaska, eastern and western Caribbean, northern Europe and the Mediterranean. Amy has met many different people from a variety of cultures, but has learnt that beauty is in the eye of the beholder and that staying true to yourself, as well as to your roots, maintains your self-worth. Amy has always remembered one of Riebeek’s mottos, “Your attitude determines your altitude” and she has carried this positive mind-set over into her successful career. Cindy Bester (Class of 1989) attended the South African Police College and is a Warrant Officer. Her most beautiful memories of her time at Riebeek are of times spent on the tennis courts and hockey fields. Cindy believes a beautiful childhood is one where you have a close relationship with your parents. 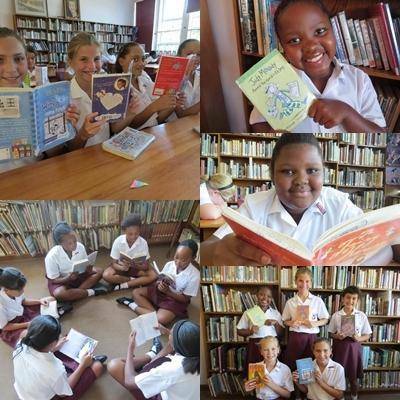 The learners and teachers of Riebeek College love to read! Miss Johnson reads aloud to her class every day and she reports that they love the Horrid Henry stories! Miss Johnson says her love for reading developed in grade five when her teacher read to her class. She believes that reading enhances vocabulary and this in turn helps you excel at creative writing and languages. The junior school always looks forward to their library lessons with Miss du Preez and Mrs Myburgh. There is always a queue of girls lined up and excited to take out a new book. Meagan Roos loves reading because “if you’re feeling sad or going through a tough time, you can escape into another world and be with your favourite characters!” Inganathi Mantewu loves reading because she gets to use her imagination and she enjoys learning new words. Buhle Tshaka enjoys reading out loud as she finds it exciting to read with expression! We encourage everybody to participate in World Read Aloud Day today and spend some time reading with family or friends. At the end of last year. Some of our girls entered a sing and dance competition. They were later crowned the Grand Prize Winners of the Woolworths Sing, Dance competition. Our journey started off on Saturday with a girl’s night in at the hostel. Later we had supper at Steers with Mrs Woods and Mrs Zietsmann. Before heading off to bed, we had a quick practice, with Mrs Woods and Mrs Ziestmann as our audience. We woke up at 3am the following morning. Mr Revnolds kindly drove us to catch our 7am flight. On our arrival at the PE airport, we were spotted by other travellers who knew our school. We took photos with two pilots, not knowing that they will be steering our plane. We met a Woolworths representative who gave us our travel gift bags filled with goodies. The representative was excited for us as she kept on giving us hugs. We sang for her and processed to board our flight. For some of the girls it was their first time travelling on an airplane. You could see the excitement on their faces. After an hour and a half, we finally landed in Cape Town. That’s when the saying “time is money” was put into reality. We received a warm welcome from Vicky, a production assistant from Big Sky Productions who was like a mother to us in Cape Town. She is originally from England and raised in Spain. She was kind enough to teach us a few Spanish words. That got us thinking we could speak Spanish. Our first stop was at the 5 star Pepper Club Hotel, where the concierge took our luggage and we were off to a nice and fancy breakfast. We had a power walk to the Milestone Studio which was a street away from the hotel. The hard word began. We were welcomed by Ursula Chikane, a presenter on Top Billing. We thought we were going to record the song and leave, but we were wrong. We had to sing the song more than 10 times, with the producer telling us it’s the last time every time. We weren’t complaining at all because practice makes perfect. We had just started with the recording of the song when we saw Johnny Clegg arriving on the other side of the production room. We were very excited to see him. As the ladies that we are, we decided not to scream or shout. After several takes and hours of recording we headed off to Prestwich Primary School. We spent 4-5 hours filming and singing. Lelethu and I were interviewed by Ursula where we taught her the hash tag gesture as well as the “Catch-it” catch phrase. We made friends with children who were younger than us whom we met while busy with the filming. We totally experienced the difficulty and the time and effort you have to put into filming or recording a song. After this experience, we totally respect the media world because now we understand the process. After a long, hot and tiring day; we headed back to the hotel to rest for an hour and freshen up. We were totally impressed with how luxurious those rooms were, and the view was just spectacular. We eventually got time to go shopping at the V & A Waterfront; where we also had supper at the most elegant Italian Restaurant, Balducci. The next day we had an early start. We headed off to the Grand Parade. At first we thought we were going to be part of the parade, but actually we were going to film the last scene of the song video. The last scene was taking place at the “Square”, the place where the late Nelson Mandela said his first speech after many years of imprisonment. We had to say goodbye to the directors, producers, photographs, cameramen, and the Woolworths staff members. They commended us on our charismatic presents and musical hearts. Before we headed back home, we changed into our famous pink choir T-shirts. We composed a goodbye song for Vicky and off we went to Camps Bay. We saw magnificent estate houses. We also bought ice-cream and enjoyed a walk on the beach. It was time to head back to Uitenhage. We sang Vicky our goodbye song and thanked her for her time and the wonderful hospitality. We sang all the way from Cape Town to Port Elizabeth! We would like to say thank you very much to everyone who has made this lifetime experience possible. A special thanks to Mrs Woods, Mr Calitz, Mrs Gerber, Mrs Zietsmann, Mr Reynolds, Woolworths, Big Sky Productions, Milestone’s Studio’s, Adrien Stern (from 21 Icons) and last, but not least, the Gleeful Girls (Ambesa Daniels, Pumela Kondile, Busisiwe Rooibaard, Lelethu Ntshangase, Thimna Hobongwana, Yonela Mali, Lilitha Mapela, Carleen Braun and Simbulele Gosani). My darts career started when I was in Grade 10. You could say it runs in the family as both my parents and sister play. The first year I played I did not receive my Provincial colours but I didn't let that stop me. The next year I worked extra hard and was picked out of 2 girls to go represent the Eastern Cape at the South African National Darts championships held last year in July. Out of 14 girls I was placed 7th missing the Protea team by just 2 points. I was very disappointed but was determined to make the team next year. About a week ago I received a letter stating that I had made the team because they had made a mistake. I was over joyed. I will never forget the tears in my dad's eyes because I was the first girl ever to receive my South African colours in our district. The Protea team will be in Windhoek, Namibia from the 24th to 26th August 2015. As this is my first time going on an aeroplane, I am extremely excited and am determined to win a gold medal to add to my collection. I still can't believe I have accomplished something so great in a period of two years. I cannot wait to go represent my country. Siziphiwe Vumazonke reports, "I felt overjoyed to be chosen as a hostel leader. When Mrs Woods called my name, I was shocked because I did not expect it. I thank Mrs Woods and Mrs Peltason for giving me this opportunity." Sibonokuhle Baart reports, "Being a hostel prefect is such an honour. It has been my goal since I was a new pot in Grade 8. I am so happy to have made it. I would like to thank Mrs Peltason, Mrs Woods and Mrs Moss for preparing me for this title and responsibility. I am humbled by their love and trust in me." Rasilingwane Elelwani said, "When I heard that I was the Head of Hostel, I was happy but nervous at the same time. I was nervous because I did not know if I would be able to lead by example and be responsible. I was beyond happy though and I cannot even put into words how excited I am. I thank Mrs Woods and Mrs Peltason for this opportunity." Mrs Peltason reports: At the end of 2014 no selection of Head Girl and prefects were announced. 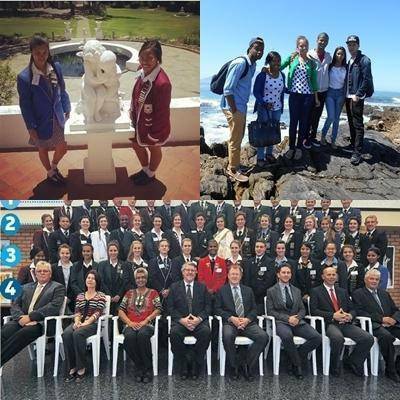 Only two appointments were made: Elelwani Rasilingwane, prefect, and de facto Head Girl, and Kuhle Baart, Prefect. At the time everyone knew that this was a temporary state of affairs and not ideal. When Siziphiwe returned to the hostel she began serving as a Monitor. All three returned early to prepare for the arrival of the girls. These girls have done so well, have been such examples to others and have put in much time and service to the hostel. They deserve to be acknowledged as the leaders they are. Congratulations Elelwani on your appointment of Head Girl and Kuhle and Siziphiwe as prefects. You have the full support of the girls and the staff. This year the matric girls far outnumber any other grade at the hostel. 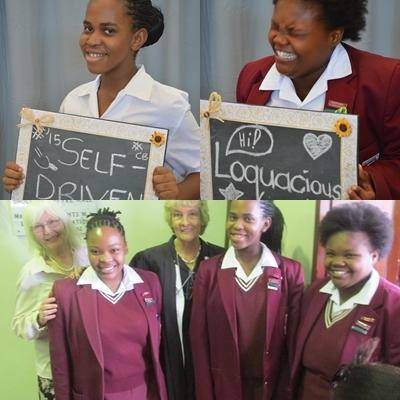 These girls have committed themselves to improving their grades and getting the very best possible matric pass. Nevertheless we acknowledge their seniority and leadership and believe that each one of them has an equal contribution to make in youth leadership in the Sholto McIntyre Hostel. Elton House day 2015 was a huge success. Under the sound guidance of Lindsay McFarlance & Michaela Balie, the Elton executives stood up to the plate, determined to show the school that time was never a factor and that their determination would drive them to a successful house day. The fundraising started off with selling favours and colouring-in competitions for the juniors, which were really well supported. Our slip-slop Day was another great success followed by our FANTASTIC cake sale that was graciously supported by all Elton girls in the school. Selling of popcorn was another fundraising effort. Our Elton house assembly was an even greater success and it started off with a bible reading done by Michaela Balie followed by the prayer done by Robyn Thomson. The guest speaker on the day was Mrs Goosen, who taught us all we needed to know about nursing as a profession, calling and career. Thank you to AnovuyoSelani for saying the thanks and handing out of the awards at the assembly. 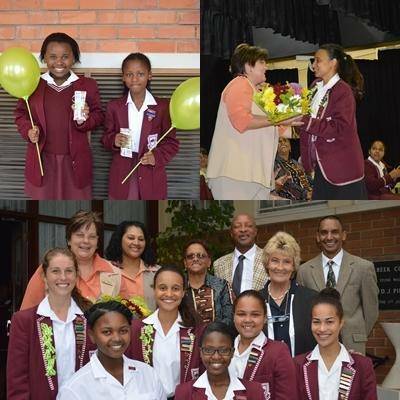 The award for Most favours bought went to Tamryn Blignaut in grade 12. The colourings in competition winners were Kamvalethu Xego and Liyema Banzi. A Special mention must be made to Mr Jonas & Mrs Woods for their support & motivation throughout our fundraising as well as to all the Elton staff & grade 12 learners who so generously supported us throughout the term. We couldn't have done it without you! 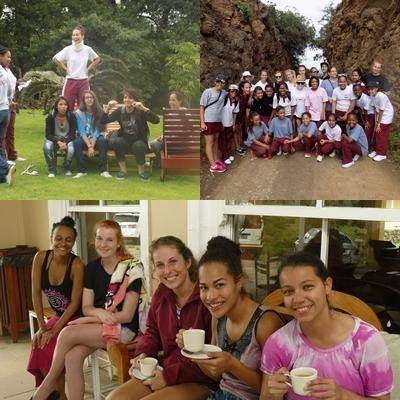 In February the junior and senior school prefects made their way to the Zuurberg Hotel, situated in-between the Addo Mountain Ranges. With a spine-chilling view and a spring in our step, we made the annual prefects ‘trek’ up the mountain. On arriving at the Zuurberg Hotel, we were met with open arms from the two FATTEST Labradors and a very generous and polite Mr Henry. Sleeping arrangements were discussed and we were all treated to our 4 star luxury abodes. Throughout the weekend we were equipped with lessons and advice in order to keep us all sane and confident in everything we do this upcoming year. With the power cuts changing like the weather outside, we did most of the planning on paper in a newly printed ‘prefects hand guide’ the teachers had so kindly put together. The constant power cuts however did not hold any of the chefs back, as the food we received at breakfast, lunch and dinner was heavenly. The fish and chocolate mousse was a memorable meal for all of us. #ZEEBEE Was a first this year, and “the amazing race” like set up that was organised for us as a team building exercise, was the highlight of the weekend. With puzzling riddles and brain wracking tasks, we were all expected to pull together as a team to get through the obstacles. The unity and integrity the prefects demonstrated on camp was excellent, and none of us can wait to put into practise all we have learnt. Thank you to Mrs Woods, Mrs Snyman and Mrs Stear for coming with us on the camp and for equipping us with lessons that can go far beyond our year as being prefects. Yolanda Mni attended Die Burger Youth Leadership Conference in December. Mrs Snyman applied and we were thrilled when Yolanda was accepted for the conference. Here Yolanda Mni reports on her experience: I was privileged to have gone to Die Burger Jeugsleierakonferensie at the end of last year as I've learnt and have been exposed to a high calibre of leaders in order for me to become a good leader. The theme of the conference was "Leierskap in die tegnologiese eeu". This was a very fascinating topic for us as youth leaders. We were introduced to different leaders in different fields who spoke to us about leadership. We also had to deliver speeches on the topic. It was enjoyable to hear everyone's views and opinions. I realised that today we are treating technology as a leader rather than a tool we as leaders can use to create solutions to problems we are faced with. My highlight of the conference was visiting Robben Island and The Leeuwenhof. At the Leeuwenhof, the residence of the Western Cape Premier, we met Mr Alan Winde, the Minister of Economic Development of the Western Cape. After our Q+A session with him, which was an eye-opener to the issues our country faces such as the standard of education, we had tea. After only a week of being together as youth leaders we had formed a bond, learnt so much from each other to be able to cope and lead effectively this year. This was an experience like no other and all I've learnt from it will forever be embedded in me and will help me in the future. Congratulations to Megan McAuley. Her submission to the Reader's Digest 100 Word Story Competition was selected as the runner up for South Africa. This success entitled her to a publication fee of R1000. I knew about the competition because my dad is subscribed to the Readers Digest and I enjoy reading it. My story will be published in April. I am planning to save the money until I can find something I really want. I was quite surprised to hear I was a runner up in the competition. I wasn't expecting much when I entered. The rules of the competition were that you had to write a story in exactly 100 words, no more and no less. I had to send in my story by the 14th of December. My hobbies are fishing, sewing, photography and of course writing. I would like to thank my parents because they always encourage me to write even when i feel that I can't. They also motivated me to enter the competition. I hope to be an occupational therapist and to someday publish a book (though I am not sure about what). 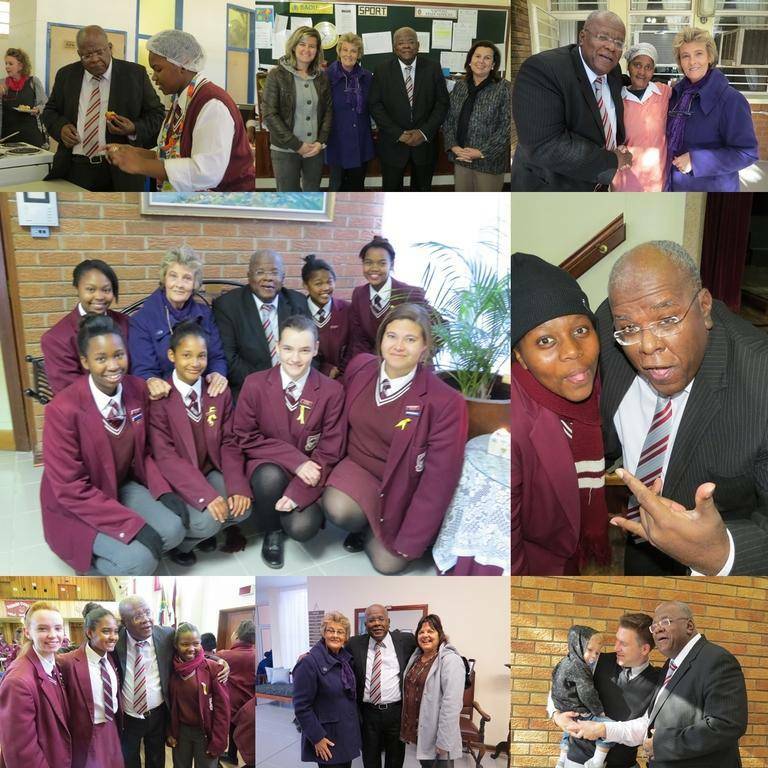 The 2015 school year begins with the absence of a stalwart of the Riebeek staff. Mrs Metcalf has resigned. Mrs Woods says, "Mrs Metcalf, a Riebeek Old Girl and faithful teacher at Riebeek, is one of the kindest persons I have ever known. She is an excellent example of living by the fruits of the spirit. We will miss her professional and delicate touch on the piano." Mrs Metcalf's Farewell Speech: I would like to say a big thank you to Mrs Woods and to all the staff for your love, generosity, support and friendship throughout our time together. I really cannot believe that I have reached this big moment. It does not seem all that long ago when I started my teaching career in Cape Town, having graduated at the University of Cape Town with a degree in music at the end of 1980. After a year at Fischhoek High, I came to Riebeek for second and third years in 1982 and 1983. After teaching at Westering High School for a further three years, and with two overseas trips to Europe and America behind me, I finally settled down to my second stint of teaching at Riebeek and I knew straight away that I had done the right thing. In 1993, I married JD, with whom I had had a blind date in our matric year. I have loved and highly valued my job at Riebeek and have always felt to be one of the most fortunate of individuals to have taught on my home territory and to have been able to impart my love for music and the arts with so many fresh, young, talented pupils. What better way to chase away the dullness – not to mention being among interesting and intelligent members of staff. I shall greatly miss the lively conversations, social functions and interactions but I know that it is my time to turn my attention to other priorities and goals. I shall miss playing the piano for assemblies, which I have been doing since I was sixteen and in Standard Eight. 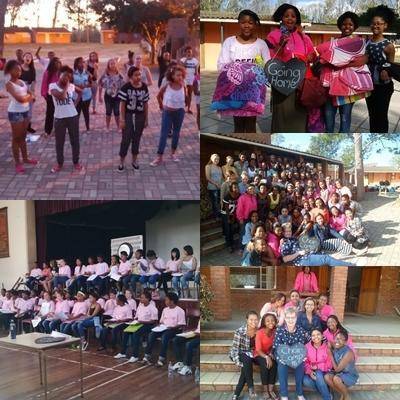 I have completed my 39th year at Riebeek as a pupil and member of staff and I played my 30th Carols programme in 2014. Lastly, but not least of all, I would like to thank God for the ability to work and for the many opportunities I have been afforded, especially at Riebeek College, which has added so much meaning to my life. I look forward to the many occasions for revisiting you all. Take care, and may God bless. Prof Jonathan Jansen was appointed as Vice-Chancellor and Rector of the University of the Free State on 1 July 2009. He is an Honorary Professor of Education at the University of the Witwatersrand, received an honorary doctorate in Education from the Cleveland State University, USA in 2010 and was elected as a Fellow of the Academy of Science of the Developing World (TWAS) in the same year. He is also a Visiting Fellow at the National Research Foundation (NRF).